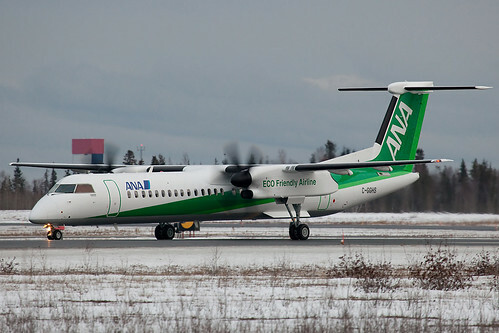 Brand New Q400 for ANA, originally uploaded by Jason Pineau. ANA Wings (Tokyo-Haneda) on November 1, 2010 took delivery of this new Bombardier DHC-8-402 (Q400) JA856A (msn 4335) painted in this special green “ECO Friendly Airline” extolling the environmental-friendly aspects on the turboprop. Copyright Photo: Jason Pineau. JA856A passed through Yellowknife on its delivery flight to Japan. This entry was posted in ANA Wings and tagged ANA Wings on December 12, 2010 by Bruce Drum. ANA (All Nippon Airways)-Air Next Boeing 737-5L9 JA355K (msn 28129) FUK (John Adlard) (to be merged into Air Nippon/ANA Wings), originally uploaded by Airliners Gallery. ANA (All Nippon Airways) (Tokyo) has decided to move ahead with the merger of its subsidiaries. Air Central and Air Next will be merged into Air Nippon (Air Nippon Network Company) on October 1, 2010. Air Nippon in turn will be renamed ANA Wings (ANA Wings Company Limited) on October 1. Copyright Photo: John Adlard. Air Next’s Boeing 737-5L9 JA355K (msn 28129) is pictured on final approach at Fukuoka. This entry was posted in Air Central, Air Next, Air Nippon, Air Nippon Network, ANA Wings, ANA-All Nippon Airways and tagged 28129, 737, 737-500, 737-5L9, Air Central, Air Next, Air Nippon, Air Nippon Network, ANA Wings, ANA-All Nippon Airways, Boeing, Boeing 737, Boeing 737-500, FUK, Fukuoka, JA355K, John Adlard on July 4, 2010 by Bruce Drum.